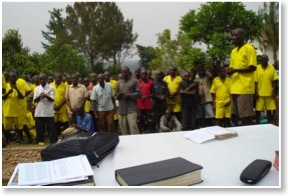 Brother Guido Vanbrabant from Belgium has felt a calling to visit local and overseas prisons to minister the Word to the inmates. He recently visited a prison in Rukungiri, Uganda for the second time. His first visit was in January of 2010. Brother Guido says, "Uganda was special, I really felt the leading to go there. I was even amazed about the message preached. I had the notes in the briefcase for almost ten years and never preached on it. That day in the prison, I started to touch these notes and everything got very quiet, even the wind stopped. We were in the garden of the prison, with about three hundred prisoners, no sound system and I had a sore throat, but you could hear a needle drop." This first trip proved to be very successful and moving for the prisoners. Brother Guido told them, "I don't believe the Lord Jesus Christ [would] send me all the way from Belgium to this prison if there was not one of His children in this prison." He went through the Bible and showed them many places where children of God were in prison and he read to them Romans 8:28: "And we know that all things work together for good to them that love God, to them who are the called according to His purpose." He let them know that they were at the right time and in the right place because, "outside of the prison they probably wouldn't take the time to listen to the Gospel." Brother Guido’s words really moved one of the prisoners, who was called up and asked to testify. Little did Brother Guido know that this man was in fact a minister of the Gospel. This man said he had heard many things preached but never like what he heard that day. What really spoke to him was how Brother Guido addressed not only their physical prison, but told them how to be released from their great prison of sin. 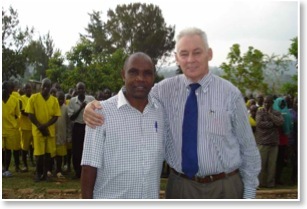 On January 20, 2011, Brother Guido returned to the Uganda prison to follow up on the work there. When he arrived he was greeted by a man who was very welcoming and had a kind spirit. Brother Guido thought him to be a visiting minister. While Brother Guido was preaching he told the prisoners, "It looks like the Lord has more of His children in this prison, otherwise He wouldn't have sent me back to preach for you." After the preaching of the Word, and a few songs, Brother Guido went back to his seat. The kind person that he thought was a visiting minister shook his hand and asked, "Brother Guido, do you remember me? Your message last year changed my life completely." This man was the same man who was called out to testify the year before. He is now preaching the Gospel in the prison. This brother is still finishing his sentence, but now has a position as prison minister. The brother who was touched by Brother Guido's service in January 2010 and is now preaching the Gospel. Brother Guido is astonished by what the Lord has done in one short year. God is faithful to His children and keeps them in the palm of His hand. He knows who are His. "Moreover whom he did predestinated, them he also called: and whom he called, them he also justified: and whom he justified, them he also glorified" Romans 8:30. 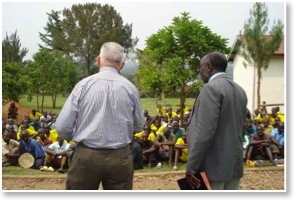 The Lord will finish the great work He has started in Uganda.